So, I decided to hazard another foray into the Dark Arts of Imovie, this time with the Marseille Sophistiqué. The MS is a rather gorgeous little deck from those clever comic book artists at TPC Games. As you can see from the photo, the box is a sturdy lift-top box that depicts 4 cards from the deck – a Major and a Minor, flanked by a King and Queen. The cards themselves are 4 3/4″ tall x 2 3/4 wide and printed on a linen-effect card which results in delightfully slippy shuffling. It’s a 78-card deck with Justice at VIII and La Force at XI. Yes, the titles are in French. 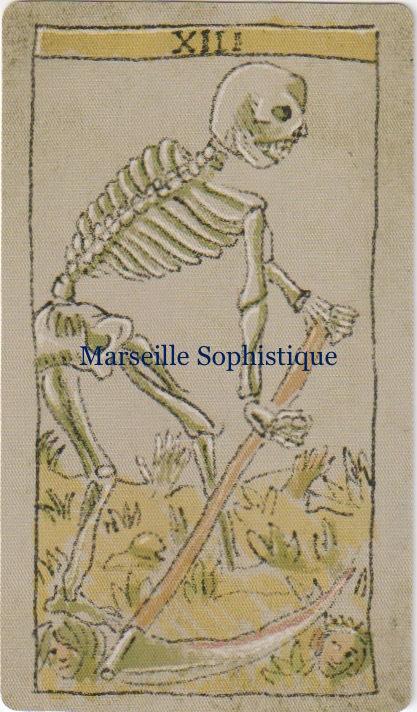 It’s a Marseille, so, yanno – get over it 🙂 The deck is based (fairly faithfully, I think) on the Conver Marseille Tarot (1760s). 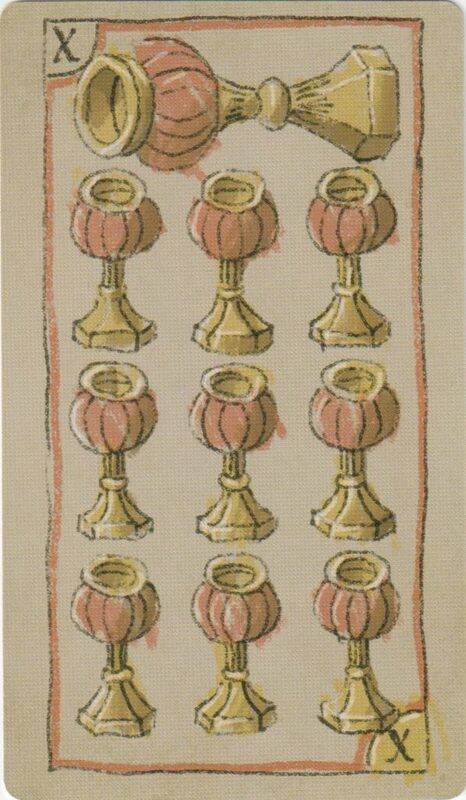 First up, this is a Tarot that has been created with GAMES in mind, not divination. 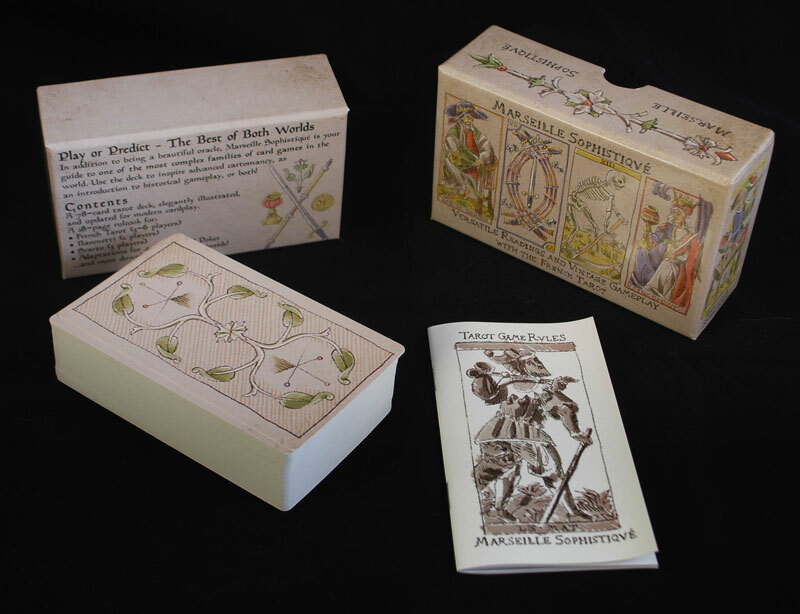 There IS a LWB with the deck, but it is stuffed to the gunwales with rules for game playing and details of games, such as Baronetti and French Tarot. They do mention divination in an Appendix at the back of the LWB, but there are no card meanings included. The first thing you’ll notice are the non-traditional hues of the colour-scheme. If the primary colours of a traditional Marseille have you reaching for your sun-glasses, then this might be the deck for you. It’s in muted shades of green, gold, blue and red, with white highlights. Very tasteful! 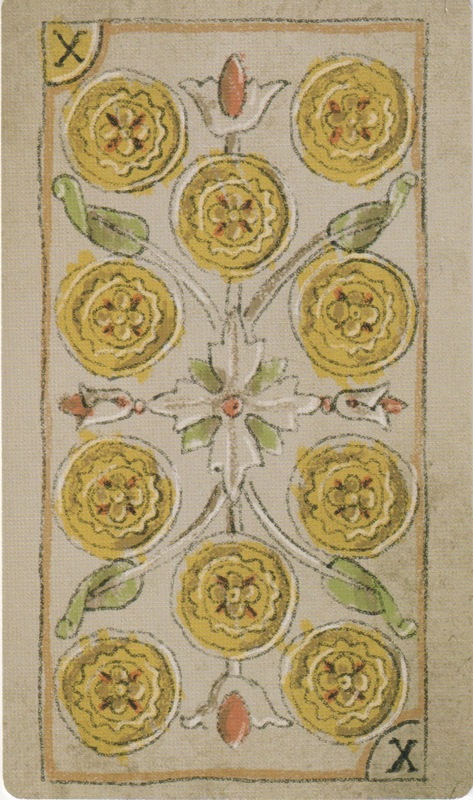 The colouring-in is deliberately quite scrappy – like an old deck – with lines clearly visible. However, although you can see the ‘pencil marks’, they colour outside of the lines just enough to be attractively arty and not so much that the untidy artwork shifts the gear-stick on your OCD into overdrive. Scribbly colouring. I like it. It’s a 78-card deck, with traditional Marseille pips. The suits are Deniers, Epees, Batons and Coupe. The Minors have coloured borders – Cups is red (more like pink, really), Deniers are gold, Swords blue and Batons are green. These borders also go around the Courts. The Majors don’t have such a border. 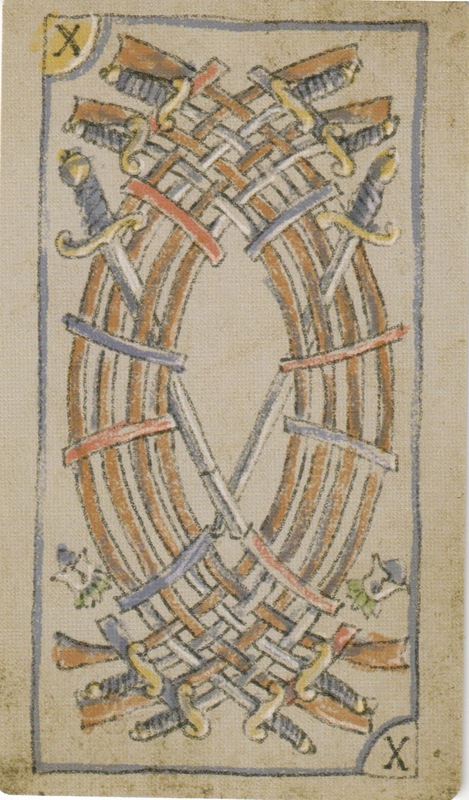 Above are the four 10s of the deck, to illustrate the Minors. There is a X symbol for 10 in the top left, bottom right corners. 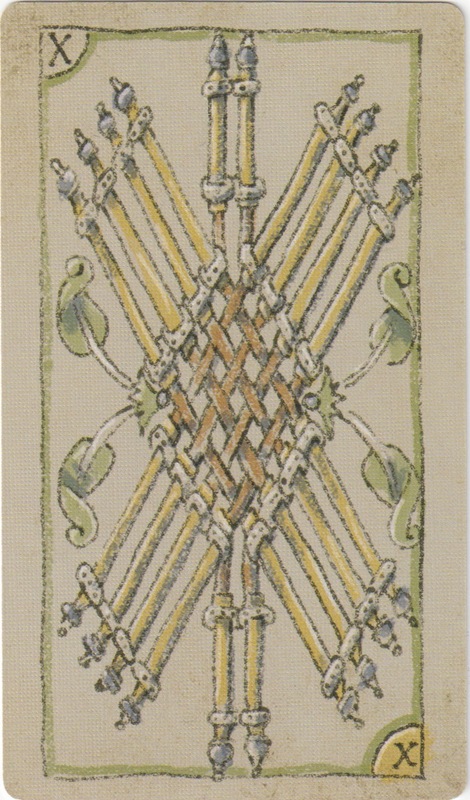 Where the X coloured yellow is in the bottom right, the card is right-sides up. Where the yellow X is in the upper left, it is upside down. The back (shown at the end of the video above) is suitable for reversals. So, what do I think? It’s a nice size for handling and it shuffles beautifully. It’s easy to distinguish Swords from Wands thanks to the colours selected. The muted, almost sugar almond, shades are delicious. And of course, the design is a proven classic. I think this deck is gorgeous and a worthy addition to anyone’s collection. 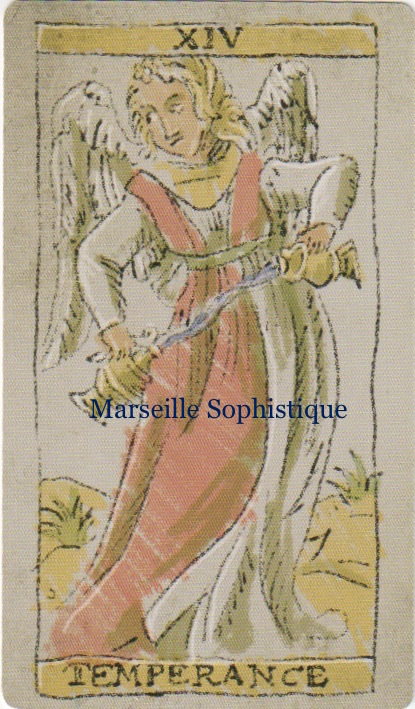 Do you have the Marseille Sophistiqué – what do you think of it? Do you use it or just admire the artwork? How are you at reading with unillustrated pips? Want more games to play with it? Update 31/3/17 – the deck can be purchased here but only US sales, alas!